Mowing the lawn has never been easier than it is today. Whatever the size of your yard, you can find options that will save you money, time, and effort. If you have a small yard, want to find a budget lawnmower that can get the job done, or have trouble pushing heavy mowers around and want to get a lighter one, then we’ve written this review for you. Here we’re going to discuss the best corded electric lawnmower for your needs so you can find the one that works best for you. This Greenworks mower has a 20-inch diameter and at 12 amps, will cut through grass that you’ve let grow for a bit. One of the neat and rarer features of this mower is that it comes with the attachments to cut, collect, and mulch your grass. We discuss the differences in these three options later on, but for now, just know that this mower can be used for a variety of yards with a variety of desired looks. The handles fold up for easy storage and the mower weighs about 56 pounds, so it’s much easier to push than a gas mower or even a battery-powered one. That said, it’s not the lightest mower. If you just want the most compact option available, keep reading. If you’re looking for a little bit more power or more yard coverage than your average corded mower, the Greenworks 21-Inch mower might just scratch that itch. This mower allows for 13 amps instead of the normal 12 or lower. That doesn’t sound like a lot, but the extra amp allows you to cut through taller, thicker grass while maintaining a wide mowing diameter. If you don’t speak yard geek, that means you won’t have to worry as much about your mower giving out on you while you’re cutting grass so high that a neighborhood kid is probably still lost in there. This mower comes with the same 3-in-1 attachments mentioned earlier: you can discard your cut grass to the side, send it into a bag, or turn it into mulch for your future yard. It also has the same height adjustments ranging from 1-1/2″ to 3-3/4″, so there are lots of options with this one. 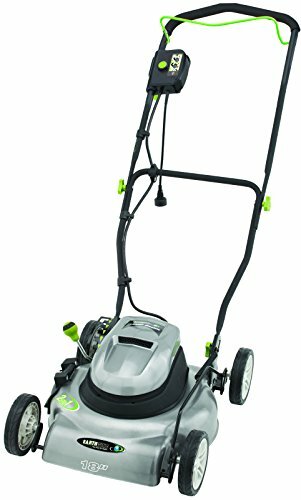 It’s a little on the heavier side as far as corded electric lawnmowers go, but it weighs in at about 56 pounds, so it shouldn’t be too much to worry about. Storage involves folding up the handles and putting the mower in a safe space. You can start it with the push of a button. This is a great mower, but the extra power comes at a price. It’ll run you a little higher than other similar products, but the wider cut and the higher power will be worth it to some. This mower comes with a four-year warranty. If you’re looking for a powerful corded electric mower that has the power to cut through thick grass and allows you to cut a lot of ground at once, this may be a good option for you. Earthwise’s 18-Inch mower is a good option for those who don’t need quite as much power and instead prefer a lighter mower. Like the previous two mowers, the Earthwise has a wider range of height adjustments than many of its competitors: you can adjust anywhere from 1-3/4″ to 4″. This mower doesn’t come with a bag, but it does allow you to side discharge your grass or turn it into mulch, so there are still some options here. This is one of the more portable options as far as corded mowers go since the handle is foldable for easy storage and this mower weighs in at 44 pounds. It’s a good option for people that have steep inclines, have trouble pushing a heavier mower, need to store a mower in high places, or for someone who gets their kids to cut the grass. Even though this mower is on the light side, it still packs a pretty good punch and can cut through thicker grass. It’s one of the less expensive options but doesn’t suffer much on power or cutting distance, so it’s a good budget buy. This is a great option for someone who has a smaller yard, someone who has trouble with bigger mowers, or those who are wanting to get a lot of bang for their buck. 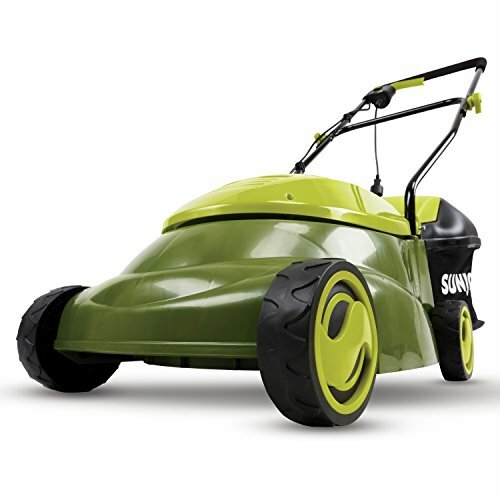 It has a smaller cut diameter of 14 inches so this mower is best suited to smaller yards. Even though the cut diameter is on the smaller side, the mower allows for 12 amps so it can cut through thicker grass. One solution to this problem is to take the bag off; you’ll get a lot of grass on your legs, but it may be a little more convenient since you’ll save a lot of time emptying the bag. There is a side-discharge option available on Amazon, but it needs to be purchased separately or with the Pro Version. This mower allows you to fold up the handles for easier storage and it weighs in at 29 pounds, so it can be mistaken as a large children’s toy from a distance. This won’t help you in your neighborhood “Who’s Got the Most Horrifying Lawnmower” contests, but it makes this mower easy to handle. It’s a good option for anyone who has trouble handling a larger mower. 6 Height adjustments available from 1 in. To 3 in. 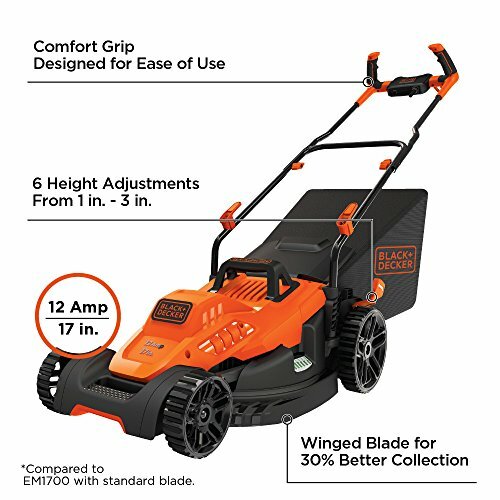 Black+Decker’s corded electric mower is one of the better ones on the market but is at a bit of a disadvantage to many mowers listed here. It’s a good pick if you want something from a well-known brand that you aren’t afraid of relying on. In some ways, this mower was designed for cutting thick grass. It uses a standard 12 amps, but sports rugged wheels to give you more control and has a special blade design that improves grass collection. If your yard is grown enough to hide a small army of the Vietcong, this mower will do better than a lot of competitors at giving you the look you’re going for. It comes with 6 height adjustments ranging from 1″ to 3″. This mower doesn’t allow you to mulch and doesn’t include a side-discharge option. The collection bag is all that we get with this one. The bag isn’t tiny but will need frequent emptying if you have a large yard. Taking off the collection bag is an option, but some people don’t like the grass hitting their legs and feet. The handles fold for easy storage and this mower weighs in at 45 pounds, so it shouldn’t be too hard to handle. You can start it with the push of a button. This mower comes with a 2-year warranty. We at OwnTheYard would recommend this mower to someone who has taller or thicker grass. This is also a good option for those who enjoy buying from name brand sellers that you’ve heard of before. All of the lawnmowers mentioned above will need an extension cord for use. Having the right cord is the difference between long life and an unexpected demise for your lawnmower. Getting too high of a gauge will kill your corded mower. If you want to be extra safe, you can try this 10 gauge, 100 ft wire. It should be able to provide enough power to launch any nuclear rockets you’re building in the backyard, too. Whichever cord you use, make sure that it’s rated at least a 12 gauge at 100 feet. Your lawnmower will thank you (and will last a lot longer). If you would like to read more about the science behind wires, amps, ohms, and gauges, you can do so here. If you didn’t notice, corded electric lawnmowers come in a wide range of sizes from 14 inches all the way to 21 inches – over half a foot difference! In general, the smaller mowers are more suited to budget buyers. It’s worth keeping in mind that the bigger the mower, the fewer passes you’ll have to make through your yard. Here is a little chart that may give you an idea of how big of a mower you need. The cut width is in centimeters. Over the course of a few years, you may end up saving yourself a good bit of time with a larger mower. How long is the included cord? The cord coming with each of these mowers reaches out to about two feet. All lawnmowers on this list will require a separate extension cord. Amazon shows a certain cord is frequently purchased with my mower. Can I use that? Maybe. You’ll need to make sure that the cord is at least 12 gauge and, unless you have a small yard, 100 feet is the option we recommend to most people (100 feet isn’t as far as we think it is!). Earthwise was born when parent company American Lawn Mowers wanted to make the world’s best mower for smaller yards. Earthwise and American Lawn Mowers strive to be the best in the business and responsible towards the environment – a mission they’ve been pursuing for over 120 years. Black+Decker has been around since 1910 and started as a small machine shop. From there they expanded their product line to all sorts of tools from machines that make milk caps, to power screwdrivers, to drill tips used on the moon landing. They’ve got NASA’s seal of approval, so what more can we really ask for? Thanks for reading our guide on the best corded electric lawnmower! When it comes down to it, the best option for you is going to be the one that suits your needs best. Ask yourself if you’ll be mowing thick or tall grass, whether your yard is on the larger side, or if you’re wanting to side discharge, mulch, or bag your grass. 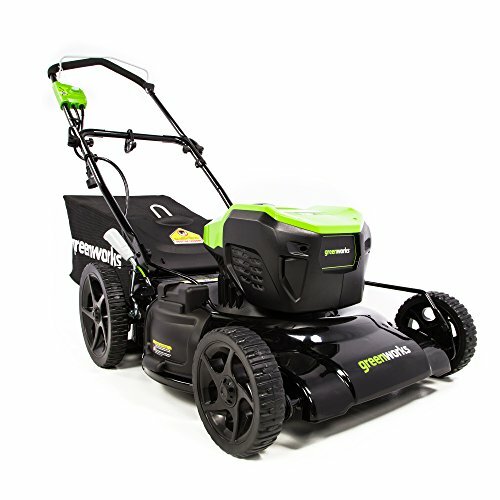 If you were going to a desert island (a very grassy desert island, and one with an electrical outlet) and could choose one mower, we’d say go with the Greenworks 20-Inch mower. It’s strong, it’s big, it has a lot of height adjustment options, and it allows you to side-discharge, mulch, or bag your grass to dispose of it as you wish. If you are looking for the lightest mower available or want the best budget option, we recommend the Sun Joe 14-Inch. It’s not the best for big yards or for very thick grass, but it’s easy to push around, no problem to store, and your wallet won’t feel too much lighter after purchasing. Whatever option you prefer, a corded electric lawnmower can cut your grass just as well as a gas-powered mower for a lot fewer dollars.